Mitsubishi Electric is planning a commercial roll-out for this next generation of interface technology as a predictive maintenance solution for its more advanced factory automation equipment such as the MELFA series of industrial robots. The system uses predictive maintenance models and simulations based on actual usage and wear characteristics to provide information on the robot’s condition and future maintenance requirements. Guidance on the maintenance tasks to perform is then provided to the operator via Augmented Reality (AR), using smart glasses. To add a further sci-fi style aspect to the solution, the actual data processing and intelligence is cloud-based, using live access to the IBM Watson Analytics AI platform to make accurate predictions and select a course of action. Once the AR platform is enabled, smart glasses can provide visual status information at any time, plus recommendations on action to take and then the information you might need to carry out problem solving or service work. Component visuals based on CAD drawings superimposed over the robot are possible, as is access to service manuals or even step-by-step instructions. Robots aren’t the only option; machine tool operators can go a step further and use the AR interface for direct machine interaction and training. Developed in partnership with the Fraunhofer Institute for Production Technology IPT, another application being demonstrated by Mitsubishi Electric uses smart tablets and smart glasses as a user-interface for a 5-axis CNC machine tool via the company’s CNC controller. Direct communication between the smart device and the machine controller allows for useful information and controls to be displayed on a visual, easy to understand interface. By providing the operator with more real-time data analysis and evaluation within the information system, decisions can be made more quickly. 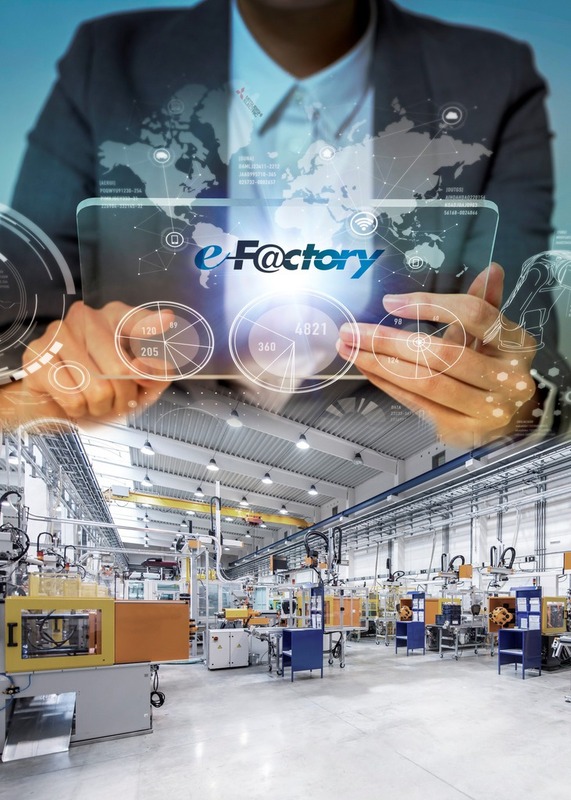 For monitoring, operators can display up-to-date production information, such as progress, remaining time, machine status or wider performance parameters such as overall equipment effectiveness (OEE). Making a system like this work for direct control and not just predictive maintenance depends on a direct exchange between the machine control system and the smart device. Communications must be close to real-time, as information is often time-critical, requiring immediate action or intervention. What it does is provide a higher level of real-time information transparency for the operator, as raw data is continually processed, visualised and automatically updated within the smart device. Pre-defined error libraries and codes are translated into meaningful messages conveying possible causes and instructions for rectification. The result is that the reaction time to solve issues is reduced while production levels and OEE can be increased. Most people in technical and assembly roles are good visual and practical learners, so being able to train, or be coached through a complex assembly or service task visually can be a great advantage. 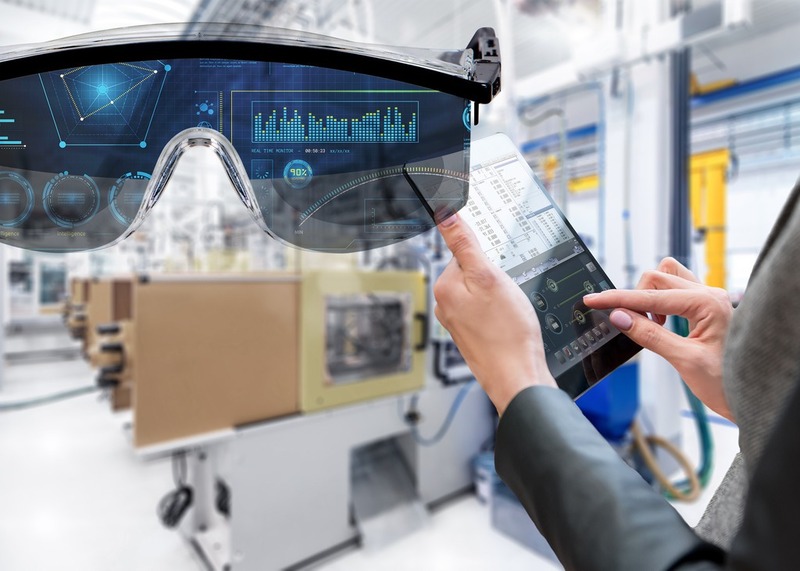 It is easy to see how if an assembly worker or service engineer is made aware of what to do in a clearly presented sequence with actions and components overlaid over their vision using smart glasses for example, then they will be able to learn and ‘do’ at the same time. It also leaves both hands free to carry out the task in question. The same technology is equally as beneficial in a pure training scenario, accessing a library of videos, PDFs or other training content that can then be displayed via the smart device. Making use of smart devices in a practical industrial environment depends on the integration and linking of the device into the relevant system; be that for accessing data processing, input from artificial intelligence, a robot controller or a CNC controller. This has been one of the main reasons for the cooperation between Mitsubishi Electric and several of its technology partners, to develop useable solutions. These innovations are designed to improve the practical everyday operation of plant systems and make industrial processes more cost-effective, as they lower production costs, increase production output from a smaller footprint, and provide more flexible and easily customisable production systems. For all those who remember the feel of the rubber keys on an early games console, and all those who have since adapted to changes in the way we interface with technology, these latest solutions are not creating an alternate reality, more bridging the gap between people and machines as we move into the future.